Though it hasn’t always been known as EXPO Chicago, there’s been a thriving international art fair in Chicago for almost four decades. In its new incarnation under current director and president Tony Karman, the fair returned to its original venue in 2012 – the charming lakeside attraction that is Navy Pier – and continues to grow and refine itself. Accordingly, a series of 30 talks examined current issues in contemporary art and its links with architecture; public installations were dotted around the EXPO venue (a woven cascade of almost 19,000 dice by British trio Troika and a delicate sculpture by Isa Genzken were respective examples of both). Meanwhile, a series of audio installations took over the Navy Pier’s existing sound system, the Palais de Tokyo put on its first satellite show ever in the DuSable Museum of African History’s historic and compelling Roundhouse space, and the Override programme saw several billboards on the motorway leading to the Chicago O’Hare airport taken over by 12 international artists. One particularly interesting section, Exposure, focused on galleries younger than eight, and was curated for the first time by someone external – Justine Ludwig, senior curator at Dallas Contemporary – resulting in a more considered presentation and selection of the artists shown. 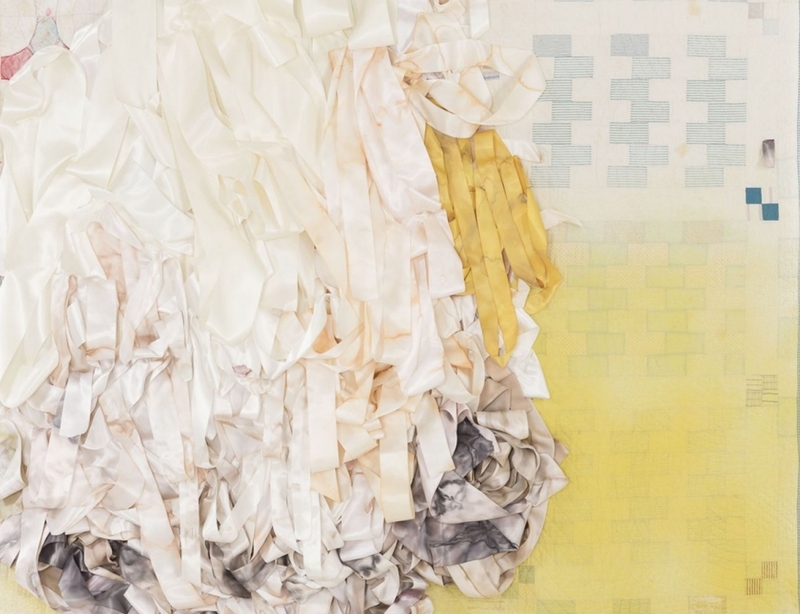 Standouts in this section were Vadis Turner’s large tactile pieces covered in upcycled and antique quilts, ribbons, fabric dye, charred wood and acrylic paint for New York’s Geary Contemporary. They explored the idea of heirlooms and the different forms they can take. Another of her pieces, Siren Swing, was made out of resin and contained the tears and sweat of 22 ovulating women, bonding them from different generations in a very visceral way. Also in the Exposure section, Brooklyn-based Japanese born artist Yuken Teruya’s mesmerising and otherworldly paper tableaux were shown by Pueblo Garzón-based Gallery Piero Atchugarry. Using paper totes or bags of big corporate brands as his canvas, Yuken cuts out impossibly delicate silhouettes of trees – the bags do the rest, creating a dappled light effect, sometimes bathing the tree in colour. The almost unnaturally serene scenes he creates appear artificial – perhaps our idea of what nature should be instead of the reality – and the resulting unease speaks of our consumer and capitalist excesses and the tolls they place on our environment. Also on the political or social spectrum was an interactive installation on the upper floor, Protest Banners Talking Back, that was part of the VIP (Very Important Platforms) programme. It featured Aram Han Sifuentes’ library of textile banners and a communal art making space to encourage people to make new ones in a very timely show solidarity to those resisting inequality and oppression. To mark the fact that the second ever Chicago Architecture Biennial opened on the same day as EXPO Chicago (a conscious move says Karman) local artist Nick Cave and Chicago’s hottest architect Jeanne Gang teamed up for the performance piece Here Hear Chicago, which premiered on opening night. Against a soulful soundtrack of jazz, a series of lab-coated assistants slowly and methodically dressed seated dancers in a series of sculptural metal cages on to which they added a series of weird and wonderful colourful fringes and objects. Only once fully encased in Cave’s elaborate, eclectic and surprisingly loud ‘soundsuits’ did the dancers get up and move about with wild abandon. Gang’s contribution may have been minimal – a forest of silver buoys that the dancers ran through and tussled with on the way into the performance – but the costumes were a form of architecture and cladding that merged with immersive art (not to mention dance and abstract jazz) in an entirely original and memorable way.